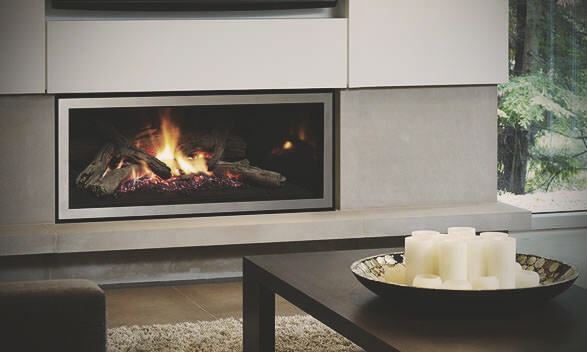 Modern fireplaces are all about the style, the ambience and the comfort they bring to the room. While they need to be effective in heating, they need to blend comfortably into the focal point of the room. Modern fireplaces are more than a source of heat; they are about warmth and comfort, about cozy times with the family. They need to enhance the ambience while adding decoration and style. Airgroup is focused on distributing only the best quality and most stylish products from around the world (into WA). We have a product and a brand that suits every design theme and application – from inbuilt to free-standing, from traditional to elegantly multi-sided. The options go well beyond style and design. Fitting with your personal flair, you can choose between the charm of wood-fire, or the ease and comfort of gas. You can even choose the fuel bed to suit your taste whether an authentic-looking log-set, or a contemporary pebble or crystal based layout. Coupled with cutting edge designs and deluxe technology Masport is leading the market in wood fire heaters. Since 1970 Masport has been renowned as Australia's leading manufacturer and distributor in home heating. Masport's credibility stems from their desire to create and deliver superior products, whilst ensuring absolute warranty cover. Coupled with cutting edge designs and deluxe technology Masport is leading the market in wood fire heaters. Regency Fireplaces has proven to be a world leader in the design and manufacture of hearth products. Regency fireplaces are a perfect complement to today’s decorating trends for clean and modern living spaces. Regency designers have maintained all of the values of a traditional Regency gas log fire including quality construction, reliable direct vent gas home heating and a limited lifetime warranty that is the best in the industry.